The best option here is an omnidirectional antenna because there’s no chance it will need to be reaimed, and the best one in our arsenal is the Winegard Metrostar MS2002. It has the ability to pull in really weak signals and it just sits happily on the roof doing its job, year after year after year. The MS2002 almost looks like a satellite dish turned sideways and it’s an excellent complement for a satellite dish too. 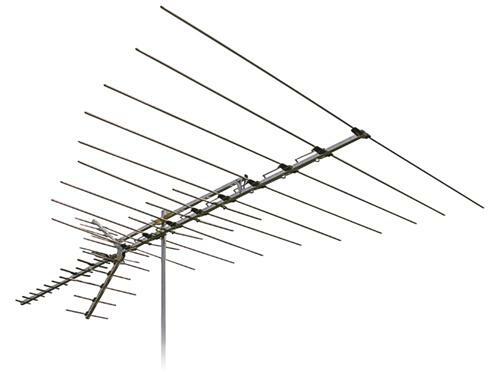 If you have a dish on your roof that you’re not using, you can usually remove the dish part and use the existing mast and cables for an easy installation. Sure. the Xtreme Signal HD8200XL is overkill. It’s a massive behemoth of an antenna and in a world where size matters, this antenna matters most. Still, if you’re going up on that roof for the one and only time, overkill is precisely what you want. If the wind whips the antenna a degree or two off, this antenna’s so powerful it shouldn’t be a problem. Say a bird falls out of the sky or the neighbor kid hits a high fly ball… knocking out one of the elements. This antenna’s got power to spare! It’s hard to imagine anything actually getting to this antenna short of a hurricane and if you’re in that kind of weather, well let’s say TV reception may not be your first concern. By the way, both of these antennas can get VHF and UHF signals, so no matter what happens in the future you’ll be safe. Understanding Amplifiers, At Least a Little.